Rain World (game, 2017). A 2017 survival platformer video game by Adult Swim Games. Developed by Adult Swim Games. Official Trailer. Rain World is a 2017 survival platformer video game by Adult Swim Games, developed by Adult Swim Games. 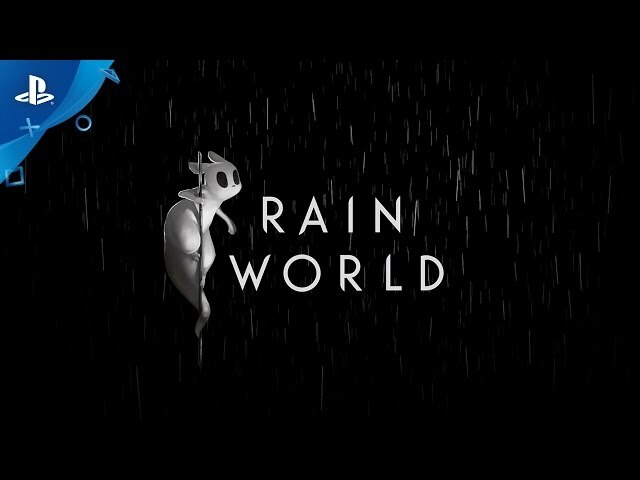 Rain World - PlayStation Experience 2016: Exclusive Trailer | PS4. The player's character, the part-slug and part-cat Slugcat, uses spears and rocks to survive a hostile, ruined, and obtuse 2D world in search of the family from whom it was separated. The player is given little explicit guidance and is free to explore the world in any direction via pipes and passages that pass through 1600 static screens, each with randomized enemies. The Slugcat can jump and use debris as weapons to avoid and hurt other creatures while foraging for sparse food, which is used to hibernate in scarce, designated safe rooms. Hibernation resets the day cycle and saves the player's progress. The player can move between regions by having the Slugcat hibernate multiple times without dying. If the player does not reach the hibernation point quickly, a crushing rain will pour, both flooding the world and possibly pummeling the Slugcat to death. Upon death, the Slugcat returns to the last hibernation save point and loses any map progress made since. The player also loses a karma point, which are indicated at the bottom of the screen. The player needs to meet a karmic threshold to reach specific areas of the game. Karma is restored upon reaching a new hibernation area, and the player can shield their current karma level by eating a yellow flower. The flower appears at the start of each area and is re-planted wherever the Slugcat dies. Enemies range from camouflaged plants to large vultures to Komodo dragon-like lizards and huge leviathans in water. Many enemies can kill the Slugcat in one hit, and some species have internal variation, such as the pink lizards that can climb. The enemies spawn at random, such that the player cannot progress through trial and error experimentation. These creatures possess dynamic AI and exist in the game's world perpetually, even when not on the same screen as the player. The player does, however, need to experiment with spears to climb walls and knock fruit out of trees. The Slugcat can hold two objects at once and switch between them. It can also eat power-up plants, which grant status effects, such as slowing time. The player's character, the part-slug and part-cat Slugcat, uses spears and rocks to survive a hostile, ruined, and obtuse 2D world in search of the family from whom it was separated. The player is given little explicit guidance and is free to explore the world in any direction via pipes and passages that pass through 1600 static screens, each with randomized enemies. The Slugcat can jump and use debris as weapons to avoid and hurt other creatures while foraging for sparse food, which is used to hibernate in scarce, designated safe rooms. Hibernation resets the day cycle and saves the player's progress. The player can move between regions by having the Slugcat hibernate multiple times without dying. If the player does not reach the hibernation point quickly, a crushing rain will pour, both flooding the world and possibly pummeling the Slugcat to death. 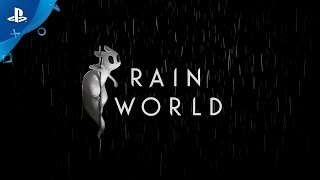 Rain World was scheduled to be released by Adult Swim Games on March 28, 2017. This video game is available for the following platforms: PlayStation 4, Windows.